Growing your own is fun, gets you outside and is good exercise. Herbs and flowers encourage bees and butterflies into your garden. Our Riverford Box to Grow flower kit provides you with an instant cut flower garden and within weeks you’ll be picking flowers for several months to bring into your home and give to friends. Our herb kits will bring you handfuls of fresh aromatic culinary flavours to add to your meals and mix in with your cut flowers. 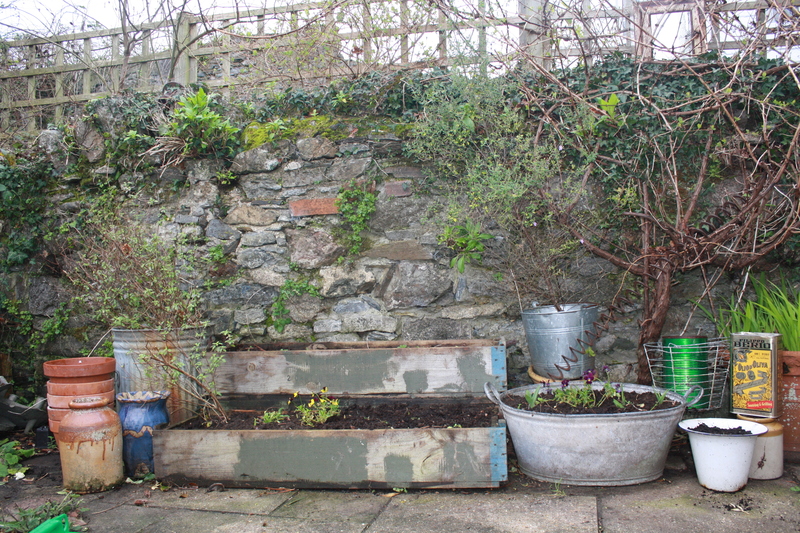 So if you like a project, there are just a few days left to order our Riverford Flower Box to Grow & Herb Box to Grow. 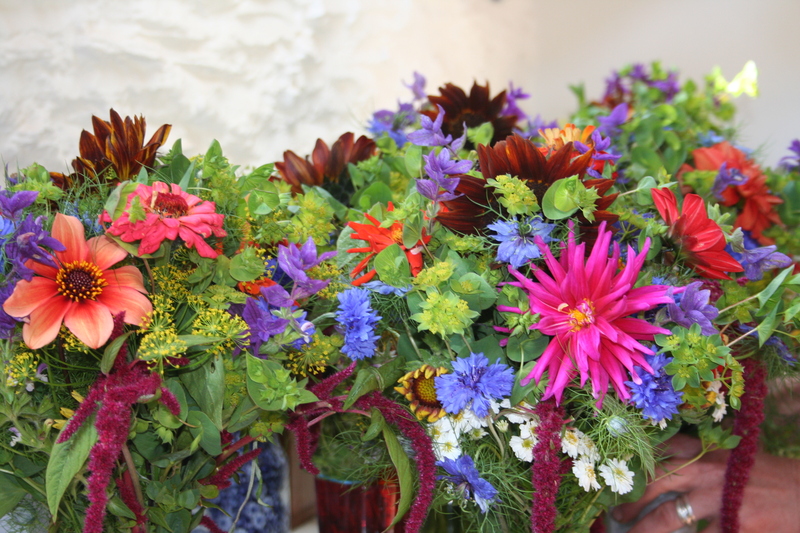 Shop bought flowers are expensive and often the choice is pretty dull. The majority of flowers sold in this country are air freighted from Africa and Columbia. Whilst you think you may be supporting the people in these poor third world countries, the risk is that they are mostly women and children, poorly paid and the workers suffer from the chemicals used. Plus you don’t have the pleasure of watching your seeds and plants growing steadily in pots, on window sills or in your garden. Any of you that tried them last year may have had mixed results due to the bad weather we all experienced, however weather conditions this year are already more favourable. We have also got some new additions to what’s in the box this year – the seedlings are bigger and stronger and we have worked on the packaging so that when the plants are in transit they are more stable. We’ve got some new varieties so now you get some Dahlias and Ammi’s in the mix. All round a much better mix with plenty of bee- and butterfly-friendly varieties. I read an article by Pat Thomas, called Behind the Label, in the Ecologist back in 2009, which I feel sums up the problem with imported flowers. Although conditions have improved greatly since the article was written, I still feel that it illustrates why growing your own for a bit of fun is better than buying imported flowers from further afield – when the floriculture industry first moved in to Kenya, to Lake Naivasha (where the majority of Kenyan flowers are grown), the lake shrunk to half its original size and the water levels dropped three metres. Due to irrigation of the flowers grown on its shores, its native hippos were threatened by the pollution in the lake and fish catches are dwindling (putting local fishermen out of business). Since the article was written there have been improvements to conditions in the area, however I still feel strongly that it is best to grow your own locally rather than fly them in from all over the world. To see more on improvements since 2009 click here. …. I’ve been waiting all summer to use that weak pun! The lettuce season is drawing to a close and we are now picking the last of our Red Batavia, one variety of which is called ‘Mohican.’ A deep red colour, the Mohican has stood up surprisingly well in the grim weather. Red lettuce, having less chlorophyll in the leaves, is less vigorous than green varieties and hence more susceptible to pest and disease as it sits in the ground for longer. Next week it will all be gone along with the last of our Cos. Apart from some Radicchio in a few weeks time that will be pretty much it for the year. Looking forward to next year’s crops, we are busy planting over-wintered onions as well as garlic cloves (to harvest as wet garlic in the spring). Along with the winter salad pack for the polytunnels, these will be the last plants to go into the ground for the year. After that it’s just a matter of crossing our fingers and hoping for more favourable growing conditions than we’ve had of late. On a lighter note the remains of the Broad Beans that we harvested in June were rotovated in and the last of this years lettuce planted in their place. The few remaining bean pods have apparently decided it is now spring and we have miniature self-seeded plants poking their heads up amongst the Cos. I picked a few sprouting tips for Rob, our resident genius in the Field Kitchen, so if anyone is heading in that direction this week they may get some of the most unseasonal veg I have seen in a long time! A cold snap has arrived down here in Devon and we’ve had some frosts in the last few days and now thankfully a little rain and hail. On my way home I noticed even a light dusting of snow on the edge of Dartmoor. What with the untimely hot weather of last week where summer thoughts and searches for shorts were both on the cards in my life and now this! What trickery Jack Frost!! Slow down and beware. Spring is just here, trees still bear of leaves and cold weather is still on the cards. The first Boxes to Grow have been dispatched from Wash and will be being delivered over the next two weeks to customers up and down the country. Today I will give you some extra advice and tips on planting out and caring for your seedlings. I want to thank our growers first who have really come up trumps this year with the most fantastic quality seedlings and plants for our veg and herb boxes to grow. I am proud to say we have developed a really good growing kit. When your box arrives you will find inside full instructions on how to care for your seedlings right from the start and how to then get on with the task of planting them out and growing them on. Below I am going to list the most important things to bear in mind. Please feel free to use me as support and leave comments and questions on my gardening blog. In the veg and herb boxes to grow there are tomatoes , courgettes and cucumber and coriander seedlings that are all quite tender so need extra care for the next few weeks or more. Basically these plants need to be protected from frost, wind and cold temperatures generally. If you have no option but to plant them out it would be wise to cover with a cloche or make a little greenhouse recycling a large plastic water bottle, or at the very least cover with horticultural fleece. In the past I have put individual cardboard boxes over such plants at night. Do not forget to uncover first thing in the morning though! I would tend to plant into a pot with some compost and grow them on a bit on a window sill if I didn’t have a greenhouse. If you live in one of the areas that have been hit with snow then it will be impossible to plant out your seedlings until it is has thawed. Make sure to take the seedlings out of the box and stand upright in a seed tray or cut the box down so that the plants don’t get leggy searching for light. Place the seedlings in a polytunnel, greenhouse, conservatory or window sill. Basically they need light and protection from freezing weather for the moment and ideally shouldn’t be put anywhere too warm either. The plants shouldn’t need watering but if look at all wilted or dry then do water gently with a watering can. Follow the instructions provided with the kits. The Cabbages, beetroot, rainbow chard and the kohl rabi in the veg kits can be planted quite deeply however make sure the other seedlings and lettuce particularly are planted level with the ground and not at all below the surface. Be sure to gently water in your plants after planting them in the ground and check for slugs and snails before ideally covering with horticultural fleece. Fleece will help protect against frosts and cold temperatures and give your plants a head start generally. Remove the fleece carefully every few days for watering as required. Once the weather has warmed up the fleece can be removed. Keep an eye on the weather and check your plants regularly. Keeping your plot, planters or pots free of weeds is important for the success of your vegetable growing. Use a hoe if appropriate to your situation and hand weed around the seedlings themselves. Your seedlings will take a few days to adjust and recover from their hike over dales, down and up hills and so on. Look after them tenderly and give them the best chance of success. Speak to them nicely and before you know it they will start doubling in size over and over so do pay attention to the suggested planting distances to. Good luck! Our regional farms around the UK (and one in France) are our way of growing fruit and veg as close to your home as practical. Three acres of broad beans were sown in January and, hungry crows allowing, they should be ready in mid-June. We’ve covered the crop with mesh to help protect the emerging seedlings and warm the soil a little, so fingers crossed we get a decent harvest. 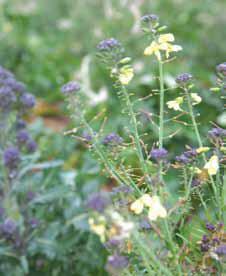 Spring greens and purple sprouting broccoli have done well despite a little early flushing due to the mild weather. Meanwhile, our new polytunnel has earned its keep so far by easily meeting the planned yields for our winter salad leaves. The gentle start to the winter certainly helped. The final salad crops have been sown inside, after which they’ll move outside to clear the way for spring onions, tomatoes, mini cucumbers and French beans. 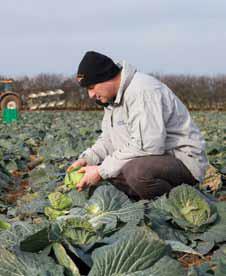 After a good season of winter crops including leeks, cabbages, kale and spring greens, it’s turnaround time for Nigel. Two acres of garlic were planted before Christmas, which will be harvested in May as the Mediterranean-inspired wet garlic. Broad beans, Batavia and Little Gem lettuces will follow, as well as spinach. The farm has nearly four acres of wild bird seed plots too, and this winter brought visitors including corn buntings, grey partridge, lapwings, fieldfares, red kites and barn owls. After the mildest winter for several years, it’s been an almost seamless transition into the spring planting season for Peter. Broad beans went in back in February, to be followed by new plantings every few weeks to keep the supply coming. Novella, the first of his potatoes (easily the biggest crop on the farm) will go in during March, as will the early carrots for harvesting as bunches in June or July. 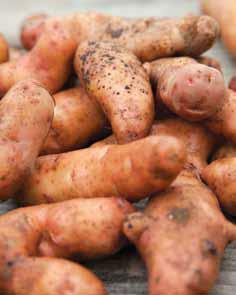 This year Peter also hopes to try out Pink Fir Apple potatoes; fantastic to eat, but a devil to grow organically. The spring onions that Chris and his team planted in the polytunnels during November got off to a great start, thanks to the mild conditions. The crop should yield a very healthy 25,000 bunches around two weeks ahead of outdoor-grown plantings in March. Butterhead lettuce also went in during early January, and once those crops are cleared, the herb season recommences. Coriander, parsley and basil will be nurtured in the warmth of the polytunnels, while sage, thyme, rosemary and oregano will grow outside. There will also be a new crop of mint, after some culinary testing! Our autumn-sown carrots are doing well, putting us on track to have them ready in April to plug the supply gap before the UK crop is ready. Meanwhile our spinach is struggling; poor germination followed by some fairly extensive frost damage have taken their toll. Thankfully the Batavia lettuces are looking good under their mini-tunnels, and we are busy planning in chilli peppers, squash and 25 acres of sweetcorn, possibly to include a multicoloured variety. After experimenting with Cape gooseberries and tomatillos back in Devon last year we’re giving both crops a go here in France this summer, as well as the locally popular Mogette beans, for drying and relishing in winter stews. One of the nice things about purple sprouting broccoli is the way that varietal names all tend to reflect the red/purple nature of the crop. We have been slowly munching through Rudolf and Red spear since mid-November and although they are now over, Red Head is in full swing, Mendocino started last week and we picked the first of the Cardinal crop on Sunday. Next up will be Claret followed by some Late Purple in April. 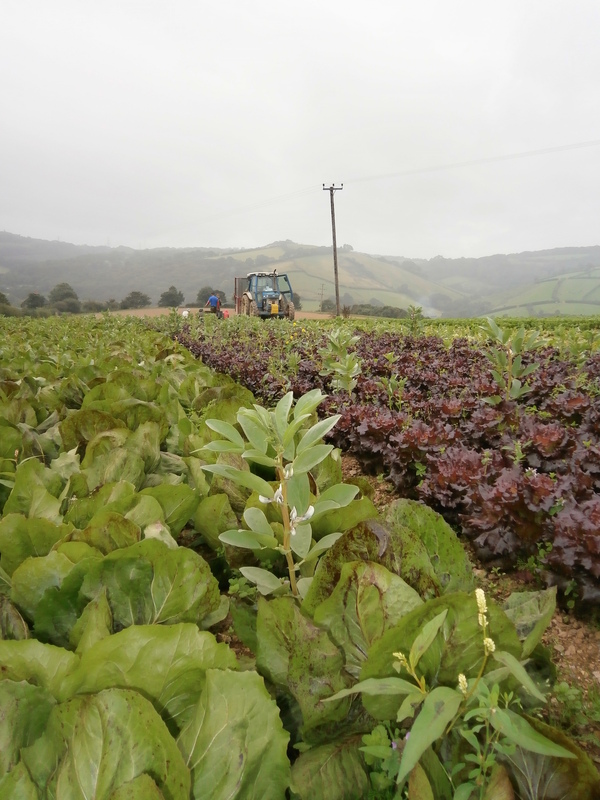 Peak production is approaching fast and by early April we could be picking four tonnes a week at our farm in Devon alone. Each crop will be picked over several times. The first time through is usually quite light, where we take out the primaries (the main head at the top of the plant). This encourages growth in the secondary shoots that grow up the sides of the stalk: these are the more familiar spears that look (and cook) much like asparagus. 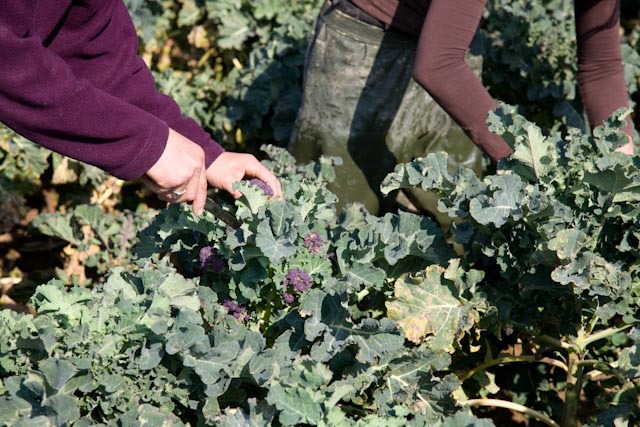 I personally love PSB – it is one of my seasonal benchmarks – but it’s back breaking work to pick and by late April most pickers have purple spots dancing before their eyes and are praying for the final pick to come. 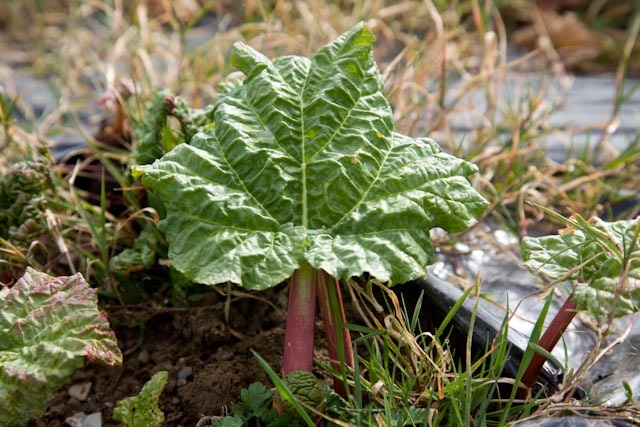 Rhubarb is a perennial crop that comes back year after year; but after a time the crowns become tired and crowded out by weeds and yield consequently suffers. Some of our rhubarb has been in the ground for five years now and it is time to move on to pastures new. Last week we started going through our field, digging up some of the older plants and splitting each one into individual crowns ready for replanting. Each plant can produce as many as six or seven crowns (although three or four is more usual) which can then be put back in the ground to grow on in their own right. These transplants won’t be harvested this year as we want them to build up energy and bulk in their root system for the years ahead. Don’t worry though – we still have plenty in the field to last through this year! It will hopefully be available to order in April. Rhubarb is usually the first major planting job of the year for us: we planted some broad beans in mid-January and some salad in the tunnels in early February (which has now germinated), but it is not until March that we really get going. After working on the rhubarb we shall have a couple of weeks grace before getting our teeth into spinach and swiss chard followed by lettuce, summer brassicas… and suddenly the relative calm of winter is over. I am looking at the different ways we can grow plants in our outdoor spaces. Not all of us have a garden with open ground, some have only a patio covered in paving slabs, some maybe only a few window sills or a passage or back yard. 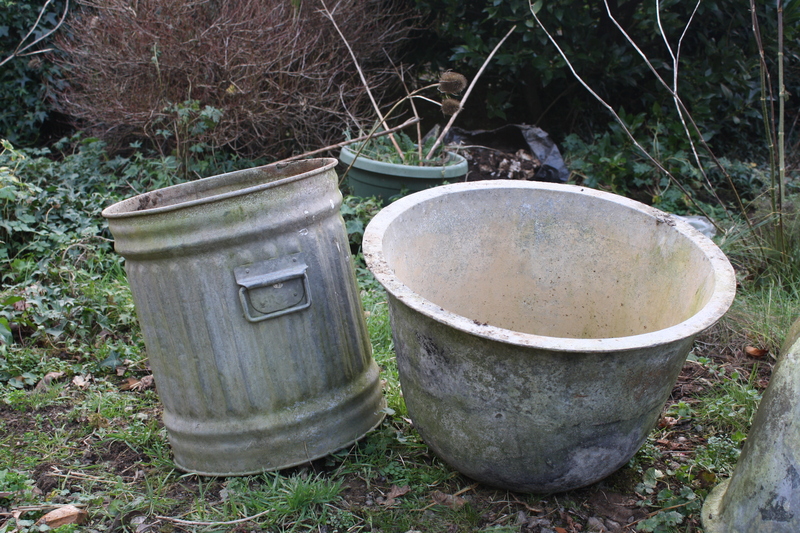 I grow a lot on my patio in a mixture of wooden boxes, ceramic pots, old galvanized tanks and dustbins I have picked up at the recycling centre or down the dump. They look really great with plants trailing over the edges and climbers growing skyward up trellises I have set up behind them. I have got the local farm shop to save me some olive cans that come in bright green and red. I make holes on the bottom using a hammer and screw driver to allow for drainage, add some broken crocks or some small stones before adding a growing medium and a plant. I am always on the look out for containers with a difference. Recently I bought some old ammunition boxes for next to nothing, £3 each which I have planted up with tulips for a show in spring. These are fairly shallow but great for lettuces in the summer. The main thing to consider is the depth of the container and whether it is possible to make drainage holes in the bottom. Plants grown in pots and containers get full of roots pretty quickly so the deeper the better. Anything grown in a container is a commitment you have to feel able to take on as the ongoing maintenance is essential to your growing success. They will need watering everyday in hot weather and every other day once they have taken a hold. Your containers will also need feeding after a month or so of planting out and every two or three weeks after that. For a long time now Riverford have been supporting a charity called Send a cow who ‘provide livestock, seeds, training and on going support to help families in Africa to leave poverty behind for good’ Guy is a huge fan of this charity and has been out to Uganda several times…… to see what’s happening first hand. Some of their growing techniques are ingenious such as the keyhole garden and the grow sacks. We have built our own keyhole garden using posts and chicken wire rather than stones. 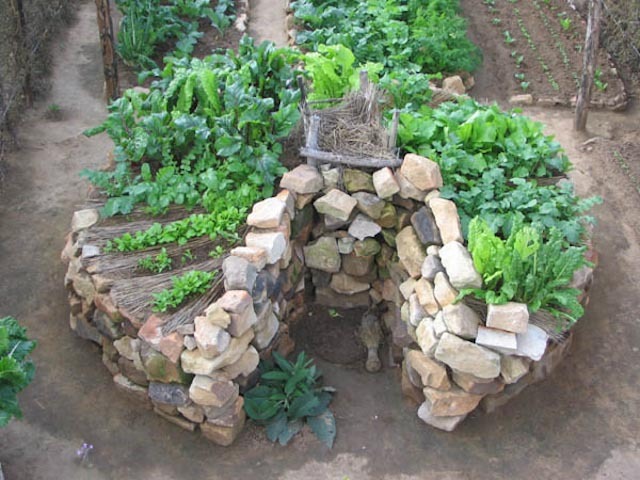 The idea is you have a central shoot into which you chuck all composting materials and water. This in turn feeds the surrounding beds that are planted up with veg seedlings. It really does work and also is a boon for anyone with back problems as there’s little or no bending down. 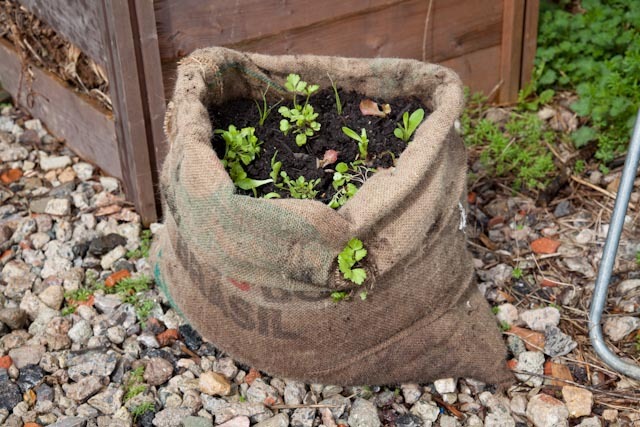 The grow sacks are great to and can be planted with up to 50 seedlings in each. These are great for that redundant corner somewhere in your outdoor space. I will cover preparing the ground and tools and kit you will need as unfortunately run out of space here. So look out for people selling sacks of well rotted manure and take a look at your compost heaps too. Our new polytunnel is up and running, producing organic salad leaves for the winter. Come April the crop will be replaced with basil, mini cucumbers and tomatoes. We never heat our polytunnels and as the new crops will reduce our reliance on imported veg, they’ll be some of the most environmentally-friendly salads around. Meanwhile the mild autumn brought many of our crops forward; our Brussels sprouts were ready a good three weeks early and we were picking very good spinach through to mid November. 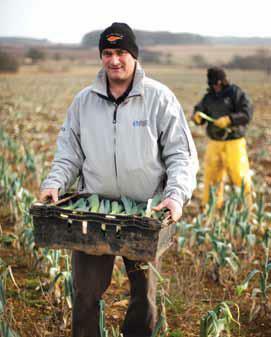 Many of our leeks were also at harvesting size before Christmas, when normally they are not ready until March. All in all, it’s been a refreshing change from the difficulties of last winter. The battle with the pigeons is continuing for Nigel and the team, so much so that we have had to cover the brassicas with fleece to stop the birds eating the lot. The cabbages have taken a bit of a hit from whitefly too, but things are back under control now and the first crop of cauliflower is set for harvesting in March. 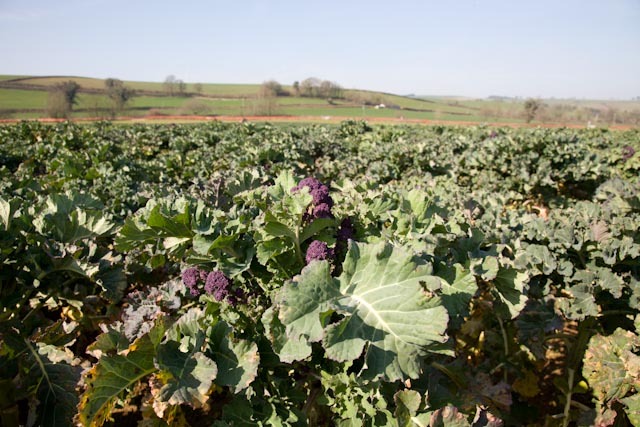 The organic spring greens and purple sprouting broccoli are looking really strong, while the wild bird seed plots on the farm are keeping the wildlife happy as the weather gets colder. 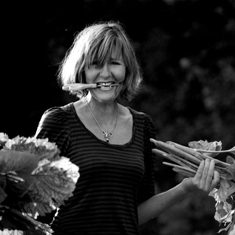 The mild, dry autumn has made the weekly harvesting of Peter’s organic carrots and organic parsnips much easier this season, but with no cold snap to slow their growth, around 20% of the early cabbages have got ahead of themselves. They are so big they would almost fill the vegboxes if they went in. Thinking back to this time last year it seems daft that we are now hoping for a chilly spell. Back then the veg was frozen into the ground under a layer of snow and temperatures were as low as -15˚C. At least there are fewer frozen toes this year! The summer may be long gone, but Chris and his team still have the polytunnels working hard. Half are nurturing overwintering spring onions that should yield around 20,000 bunches at the end of March. They can be grown outdoors, but by bringing them under cover they’ll be ready a few weeks earlier. Meanwhile the rest of the polytunnels have been cleared and composted in preparation for 15,000 Batavia and Butterhead lettuces for planting in January. The perennial herbs are overwintering well after pruning last autumn and we are planning an outdoor mint crop to go with your new potatoes this year. Last year we sowed carrots here in the spring and subsequently were able to harvest some in late May, two weeks ahead of the UK crop. This still left a two week gap after our stored carrots finished. This year, after sowing in the autumn instead, we should be able to have our own carrots for 52 weeks of the year and banish Spanish carrots from the veg boxes. The crop has emerged well and we aim to get it covered with mini polytunnels before the first major rain of the season arrives; if they survive the winter storms we’ll be pulling tasty bunched carrots at the end of April. Making the best use of soil type, climate and growers’ skills at our regional farms around the UK is our way of growing fruit and vegetables as close to your home as practical. Though we grow around 80 different varieties of veg in Devon, the biggest volume by far is potatoes. Along with our co-op of growers we’ve had 250 acres of spuds on the go this year, in an array of varieties selected above all else for flavour. Overall it’s been a good growing season with very little blight. Meanwhile our winter brassicas are looking very healthy too. The damp August got them off to a good start, with plenty of moisture to get them established. The dry September meant there was less fungal disease about, so our leeks are looking in fine fettle too. However all this good work can be undone if we have another harsh winter like last year, when 30% of our purple sprouting broccoli was lost to frost. Fingers crossed for an easier ride from Mother Nature this time. 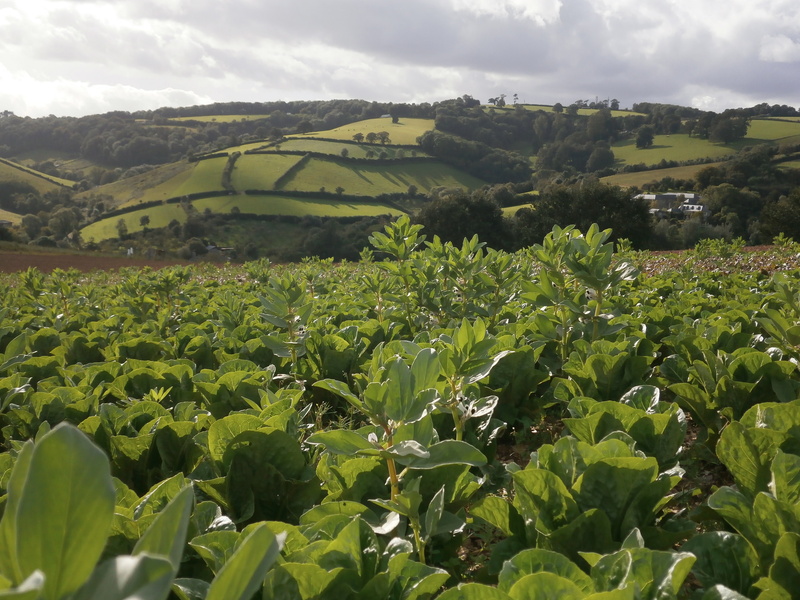 After losing much of our six acre swede crop to a suspected attack of cutworm, and our chard to blackfly, things seem to have turned a corner for Nigel and his team. The beetroot and spinach crops were saved from devastation by an army of ladybirds, which arrived just in time to see off the blackfly and give the plants enough time to recover their growth. The eight acres of leeks planted between April and June this year are looking very strong, and the team expect to be harvesting them through to the end of January. They planted a mixture of varieties that mature at different rates. Meanwhile the last of the 30 acres of red and brown onions grown at Sacrewell (they love the free-draining soil here) have been harvested and are now snug in wooden crates in the drying barn, ready to see you through the winter and beyond. 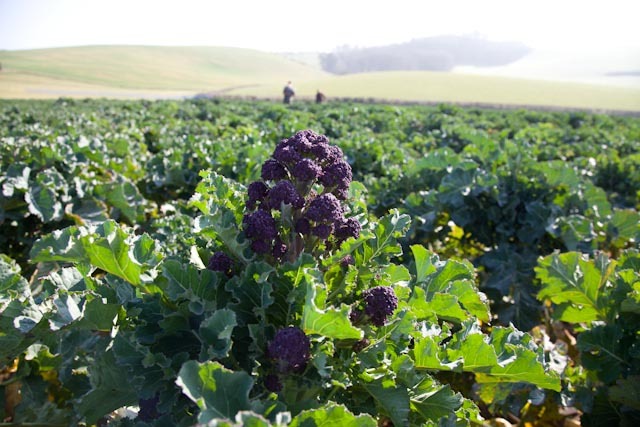 Half the purple sprouting broccoli crop was lost last year, but we’ve planted another four and a half acres for January. It’s been a good year for Peter; after terrible crop losses last winter (all his cauliflower and purple sprouting broccoli crops were wiped out), the warm spring set the young seedling veg up well for the growing season. For the autumn crops it’s been a ‘forward year’, as Peter describes it, with much of the veg being ready weeks earlier than normal, especially the cauliflower. The ten acres of organic parsnips are looking particularly good, as are the leeks. All we need now is a good frost to set the sweetness in their flavour, but not so much of a freeze that we can’t get them out of the ground. After a busy year harvesting herbs, chillies and banana peppers (yellow ramiro peppers) from our polytunnels, Chris and his team have cleared them out and now have the winter crops in place. We are growing Butterhead lettuce, which will be harvested for your vegboxes until a little before Christmas, and are overwintering a crop of spring onions, ready for harvesting in March and April next year. The perennial herbs growing outside have struggled over the last couple of winters, especially the rosemary, but Chris is hoping to dry the final cut from the sage bushes, so you can still enjoy it in the colder months. It’s early days yet, though! 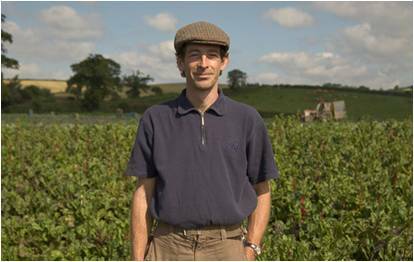 Many of our organic turkeys are reared by Ed Walters, whose family has been farming turkeys for over 35 years. They are Kelly Bronze birds, a slow-growing breed that reaches full maturity naturally, spending the first five to six weeks snug in a barn under heat lamps, before going out to grass from around eight weeks of age. They are bedded down with fresh straw every day and tucked up in the sheds at night to protect them from foxes. They spend their days trotting and gobbling their way around the organic pasture and popping in and out of their sheds whenever it takes their fancy. 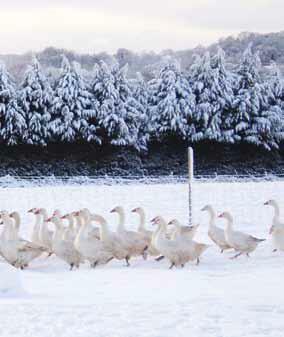 For the first time we have organic geese available for your Christmas table and Ross is the chap charged with rearing them. The Gardner family has been farming poultry for over 40 years, so they certainly know how to keep their birds happy. The geese arrived at the farm as day-old goslings in May and were reared under gas brooders to keep them warm for the first 12 days. They now pad about the fields in a small flock of 250 birds and graze the organic pasture, along with a little supplementary organic feed. They are determined foragers and have plenty of outdoor space to express their natural behaviour, though they prefer to head inside their straw-filled barn at night.